The North Dakota State University Loaner Horse Program is a collaboration between the NDSU Equine Science Program and area horse owners. 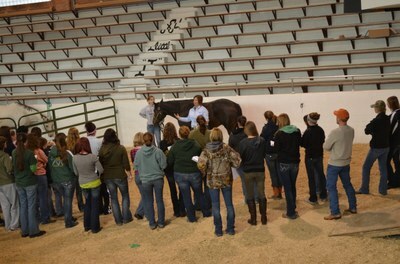 The Loaner Horse Program is a collaboration between the NDSU Equine Science Program and area horse owners. Qualified horses are leased to the program from the beginning of September until the beginning of May. 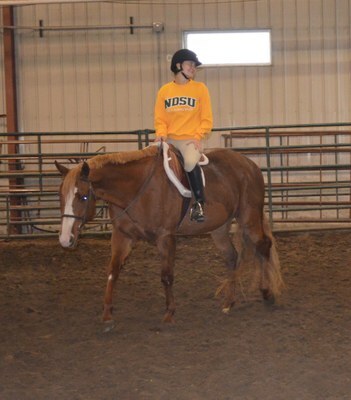 During this time, horses are utilized for NDSU classes, for equestrian team practices, and for outreach events hosted by the NDSU Equine Science Program. The Loaner Horse Program is a mutually beneficial program as NDSU students benefit from a diverse group of horsemanship and reining horses each year. Horse owners benefit as NDSU takes over the cost of care for the horse during the lease period including cost of: feed, basic farrier, and deworming. In addition, horses are exercised daily and returned to owners in shape and ready to be used. Horses are fed individually in their stalls each morning. They are then turned out in group turn-out pens with free choice grass hay and water for the day. Horses are brought in when necessary for classes or practices and returned to the outdoor turnouts once the class or practice is complete. In the late afternoon horses are again brought in to their stalls and are fed their evening feed. Horses remain indoors overnight. Horses are usually ridden one to two times per day. On weekends, horses stay on the same turn-out schedule, but are not ridden unless the Equine Science Program has an event utilizing the horses. Only well trained horses are accepted into the program. Unfortunately, we do not take green broke horses for the Loaner Horse Program. Horses must be sound with no pre-existing lameness issues. Horses must be able to adapt to a variety of rider levels and experiences. Horses need to be able to walk, jog, and lope on the correct leads slow and collected. It is preferred that horses also know how to pivot, sidepass, and back willingly. Horses are outside during the day in group turn-out, so individual horses must be able to adapt to group housing. Horses should be free of vices including but not limited to: bucking, kicking, rearing, biting, and cribbing. Horses must be fully vaccinated (Eastern/Western Encephalitis, Influenza, Tetanus, West Nile, Rabies, Strangles, and Equine Herpes Virus 1, 4), teeth should be check and floated if necessary within a year of arrival, and feet must be trimmed within two weeks of arrival. Horses are admitted into the program on a 30 day trial period. If the horse is not adapting well or if pre-existing soundness issues are identified, owners will be contacted and the horse will be removed from the program. Also, if the horse’s health or wellness comes into question at any time throughout the year the owner will be contacted and the horse may be asked to leave the program. If you think your horse would be a good fit for the NDSU Loaner Horse Program, please send a video or a link to a video of the horse being ridden. The video must include the horse walking, jogging, and loping both directions. It should also include the horse stopping, backing, pivoting, and sidepassing. Videos will be screened and owners will then be contacted with a decision about the fit of each horse to the program. If sending a link to the video please e-mail it to tara.swanson@ndsu.edu.